Get set for kick-off with our Custom Footballs with Logo for brand awareness and publicity. During our 14th championship for the nations, why not celebrate Euro 2012 with a good quality Mitre® football with your personalised branding and logo printing? Our logo branded Mitre® balls are great for football clubs and pro footballers, and with our standard 26 panel size 5 range football, personalisation can be made easy for a tailored promotional freebie for clients and customers. 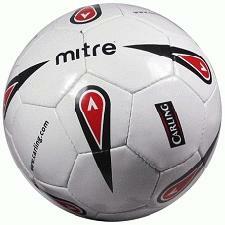 For a FREE QUOTE, please fill in the form regarding our Custom Footballs with Logo and we'll be able to help you.